Finley is wearing 18 month clothes. Such a big girl! She weighs about 22 pounds, but is still rather short it seems. (No official measurements). Since her 10 month post, Finley took her very first steps! She is getting better and better every day. She tends to try to run and get a little ahead of herself, but she's getting there. Needless to say, she's keeping us VERY busy!! Finley has finally mastered saying Daddy...and now says it CONSTANTLY! She still says Mama and Bubba as well. She has become a master at pointing...adorable! Her waving is also slowly coming along. Her primary source of nutrition is still breastmilk, but does love her fresh fruits and veggies as well. Her favorite certainly seems to be blueberries, but squash is up there as well. She is still obsessed with Frozen. We recently took a trip to visit family (3.5 hours away) and discovered listening to the movie was the only way to calm her. We also found some Frozen tissue boxes at the Dollar Tree a few days ago and she was THRILLED! Forget toys, that box is all she needs! But seriously, as far as toys, her favorites are still her dolls and her Olaf plush. She also really enjoys big brother's Thomas toys. In addition to the four teeth she'd already had, two more have popped through the top this month. She has two more bottom teeth she's working on as well. Big brother is her favorite...she loves being with him and watching him be silly! She does better in the carseat for trips around town...but still isn't a huge fan of long trips. Overall, Finley is still a super happy, laid back baby. She brings joy to everyone that meets her. 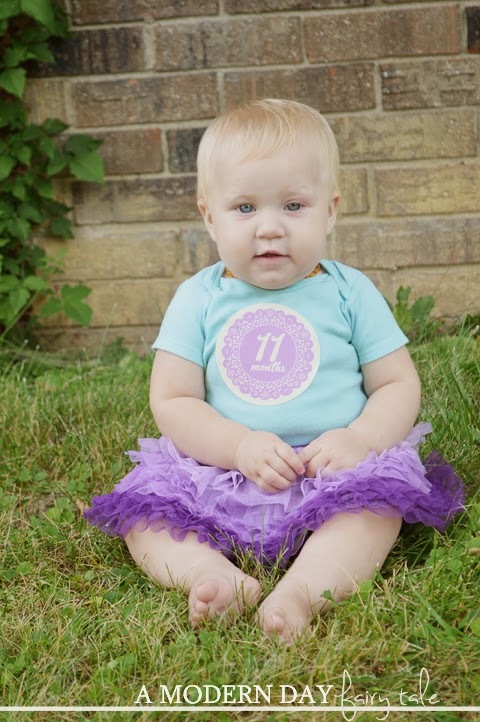 Though I am nowhere near ready to celebrate her first birthday in just one short month, I look forward to seeing her learn and grow more each day. She is too cute! She looks a lot like Shaun!